Hummingbirds can be exciting to see, but more than one birder has been disappointed to discover they may not be looking at a bird at all. Hummingbird moths are fantastic imposters that can look strikingly similar to these popular birds. Knowing what to look for can help you tell the difference between these large insects and the tiniest of birds. The term "hummingbird moth" is applied to many medium to large moths in the Sphingidae family and Hemaris genus of moths. There are more than 1,200 species of these moths worldwide, and roughly 125 of them can be seen regularly in North America. These insects are also called hawk moths, sphinx moths, clearwing moths, bee moths, and bee-hawk moths, and in the caterpillar stage, they are called hornworms. Hummingbird moths share many common characteristics with hummingbirds, which often leads to confusion if birders aren't aware that these distinct moths may be nearby. Both of these creatures are effective pollinators of many of the same flowers, and hummingbird moths also sip nectar from many of the same blooms hummingbirds prefer. They may even visit nectar feeders. Their body shapes are similar, and hummingbird moths are also agile fliers that can hover, fly sideways, or fly backwards, just like hummingbirds. These moths can have brightly colored bodies, similar to the birds, and their wings make a blur in the air just like flying hummingbirds, even creating a humming noise. The many similarities between hummingbirds and hummingbird moths are a case of convergent evolution. Both the birds and the insects developed these characteristics independently through eons of evolution, and they both fill similar ecological niches. Birders who know what to look for, however, can easily learn to distinguish between these moths and the birds they mimic. While hummingbird moths and hummingbirds may seem similar, there are actually many differences to look for to tell them apart. Size: Hummingbird moths are distinctly smaller than hummingbirds, averaging only 1-2 inches in body length compared to the more common 3-4 inches of most hummingbirds. 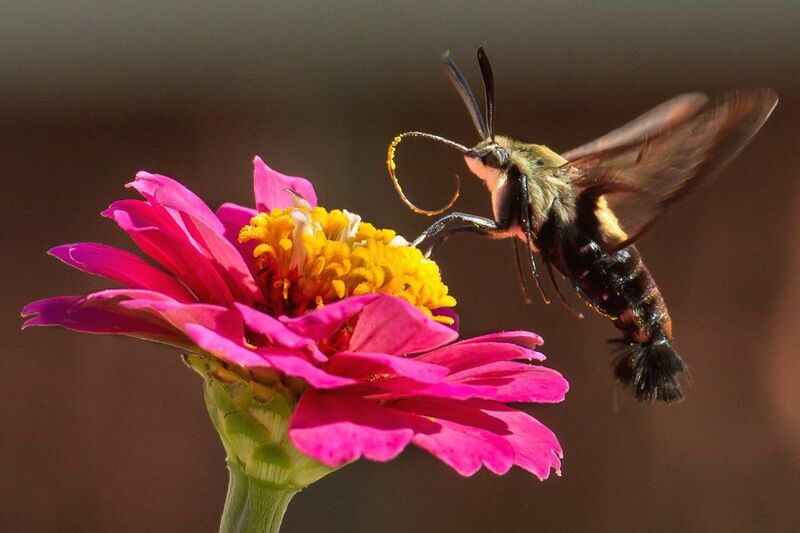 At first, inexperienced birders may assume that hummingbird moths are baby hummingbirds. Baby hummingbirds, however, cannot fly and do not leave their nests until they are nearly adult size. Antennae: Hummingbird moths have very long, obvious antennae on the head, and those antennae may be thicker at the end than at the base. While some hummingbirds have crests, no North American species do, and hummingbird plumes do not typically face forward in a distinct pair like moth antennae. A moth will have two antennae, while a crested hummingbird will have just one central feather plume on the crown or forehead. Wing Colors: Many moths have bold patterns and colors on their wings, such as stripes and spots, while hummingbirds typically have plain wings. Moths may even have transparent or clear sections to their wings, which hummingbirds will never have. Moths may have their wings spread even while perched, while hummingbirds fold their wings when they land. Legs: Hummingbird moths have six legs that often dangle as they fly and feed. A hummingbird's legs and feet are much tinier and inconspicuous, especially in flight when they are tucked tight to the bird's body for better aerodynamics. Needless to say, the birds also only have two legs. Body Shape: Moths have thick, barrel-shaped bodies, while hummingbirds have a more tapered, delicate shape, particularly when viewed in profile. The abdomen may be thick, but the head and tail are much more tapered than a moth's. Moths may also have a furry look to the body, while hummingbirds are more sleek and smooth. Bill Shape: Hummingbird bills are needle-like but generally have a slightly thicker base. While some hummingbirds have decurved bills, the curve is smooth and the bill itself does not change length in mature birds. Hummingbird moths do not have a bill, but their tongues (the proboscis or haustellum) are curled up when the moth is not feeding. When extended, these appendages can have a distinct bend, curve, curl, or break. Rump Patterns: While some hummingbirds do have different colors on the rump and tail, their color patterns are not as bold as hummingbird moths and may be very difficult to see. Many insects have multiple thick bars or very obvious wide patches across the abdomen and rump. Tail Shape and Action: Hummingbirds have tails in many shapes, from simple blunt tails or small notches to long forks or streamers. Hummingbird moths, on the other hand, typically only have short, blunt tails that may have a furry or fuzzy appearance. Birds may hold their tails still or fan/pump them while hovering and feeding, while insects nearly always open their tails to a short fan but without any active pumping motions. Flocks: Hummingbirds are more aggressive than moths, and while flocks may form at feeding areas, it is more common to see hummingbirds alone. Hummingbird moths, however, are more likely to travel together and show no aggression toward other moths. Similarly, hummingbird moths are much less likely to fly away if approached, while hummingbirds are generally warier and will leave quickly. Habitats: Hummingbirds use widely varied habitats, depending on the needs of each species. Hummingbird moths are generally more common in gardens and suburbs and not wilder, less developed locations where hummingbirds can still be found. The exact range and habitat depends on the species, though hummingbird moths are found worldwide and hummingbirds are only in the Western Hemisphere. For both moths and birds, however, tropical regions and lush habitats are home to many more species. Flower Preference: Both of these creatures sip nectar from a wide range of flowers, but many hummingbird moths prefer pale blooms. Richer, brighter colors are more likely to attract hummingbirds, depending on what flowers are locally available. Activity Time: Hummingbirds are diurnal and are only active during the day, while most hummingbird moths are nocturnal. Some are active during the day, however, and both hummingbirds and hummingbird moths may be feeding during twilight. If a flier is spotted after dark, however, it is almost always a hummingbird moth. Hummingbirds and hummingbird moths may share many characteristics, but as you become familiar both with the birds and the moths, you'll quickly learn what makes each one distinct.